As a Bronx Zoo animal-keeper in the early 1980’s, I became involved in a breeding program for Guam Rails and Micronesian Kingfishers. Both birds were facing extinction due to a most unusual threat – the introduced Brown Tree Snake, Boiga irregularis. 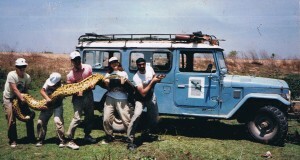 Back then, major problems caused by trans-located snakes were unknown. Although Burmese Pythons had been established in Florida since the early 70’s, these now-famous invaders had not yet grabbed the public’s attention. A zoologist friend journeyed to Guam to investigate, and he was soon regaling me with fantastic stories. In keeping with its species name, this snake was most “irregular” – biting at the moving eyelids of sleeping children, stealing burgers from grills, and often being found in bird cages – too engorged to slip back out after having swallowed the family pet! Today, the rail and kingfisher are gone from Guam, and other birds, lizards and bats have become extinct. Yet the Brown Tree Snake has not, as was predicted, eaten itself into oblivion. 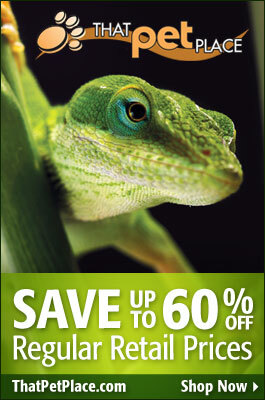 Huge populations – to 13,000 snakes per square mile – are sustained by other prolific invaders, one of which is the Green Anole! Although many accounts describe Guam as “snake-less” prior to the Brown Tree Snake’s arrival, the island does have one native species, the tiny Brahminy Blind or “Flower Pot” Snake, Rhamphotyphlops braminus (please see photo). Able to reproduce by parthenogenesis, it is a common stowaway in plant shipments. Feral populations exist in many places, including (of course!) Florida. The Brown Tree Snake most likely arrived on Guam during World War II, secreted in crates sent there from US military bases on the Admiralty Islands. Huge populations of native lizards and birds that had evolved without snake predators allowed it to explode in numbers. The snake began gaining attention in the 1950’s, and occupied the entire island by 1968. The invasion gained widespread notice in the early 1980’s, due to massive declines in bird populations and increased human-snake encounters. The Brown Tree Snake is a rear-fanged species that averages 3-6 feet in length, but those living on Guam sometimes approach 11 feet. Guam specimens range from olive-green to dark tan in color, and are marked with darker blotches. Other populations are colored brown, greenish-tan or beige with rusty-red markings. Their venom has not caused human fatalities but is a concern for certain individuals (please see below). Prey may be partially immobilized by the snake’s body, but they are not constrictors in the true sense of the word. The individuals that my friend brought back from Guam were among the most aggressive snakes I’ve seen. Bold and high-strung, Brown Tree Snakes bite many people on Guam. The Brown Tree Snake’s natural range stretches from the northern and eastern coastlines of Australia to New Guinea, the Solomons, Sulawesi and many neighboring islands. 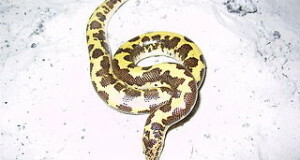 Less well-known than Guam are the many other locales to which the Brown Tree Snake has been transported. The most far-flung is Corpus Christi, Texas, where one was found after a 7 month journey in a crate shipped from Guam. It is not known if this world traveler has established breeding populations elsewhere, but it has been collected on Hawaii, Saipan, Okinawa, Wake, Taiwan, the Cocos, Rota and many small Micronesian islands. Anecdotal reports suggest that it has appeared in airports in Japan, Spain and Singapore. Common name notwithstanding, the Brown Tree Snake adapts well to brushy scrub and relatively treeless habitats. It readily colonizes villages, farms and cut-over woodlots. Although best known for annihilating Guam’s birds, the Brown Tree Snake has had a significant impact on most native vertebrates. Six of the island’s 12 lizards have now disappeared. Several, such as the Azure-Tailed Skink, Emoia cyanura and the Moth Skink, Lipinia noctura, are poorly studied and may be in trouble elsewhere as well. Three fast-breeding introduced lizards, the Green Anole, Anolis carolinensis, the House Gecko, Hemidactylus frenata, and the Curious Brown Skink, Carlia fusca, seem responsible for the continued success of the Brown Tree Snake on Guam. They now make up most of the snake’s diet, but remain common. The Mangrove Monitor, Varanus indicus, is also in decline, but this may be due to yet another introduced herp – the Marine Toad, Bufo marinus. Monitors that eat toads are killed by its virulent toxins. It is not known whether the Mangrove Monitor is native or was introduced to control rats (it seems better at controlling chickens and their eggs than rats!). Guam was home to only three native mammals, all bats. Two have been extirpated by the snake, and the Marianas Fruit Bat is now limited to a single small colony. The birds with which I worked years ago, the Micronesian Kingfisher and the Guam Rail, are now well-established in zoos. However, as Guam is their sole habitat, they are extinct in the wild. The Brown Tree Snake has also eliminated all of Guam’s nesting seabird colonies (White-Tailed Tropicbird, White Tern, Brown Noody) and 10 of its 13 forest-dwelling birds. Micronesian Starlings survive by nesting in cities, and some Marianas Crow nests are protected by electric barriers – but fruit doves, honeyeaters and others have vanished. Bites, especially to sleeping children, are very common. Small children may exhibit signs of envenomation, and in some cases must be treated for respiratory distress. Allergic, elderly, and immune-compromised individuals are also at risk. The fear and trauma factor is also quite high. Power outages caused by electrocuted snakes cost up to 4 million dollars yearly. Property values and tourism have declined, with people and businesses relocating. Guam’s air cargo industry has suffered due to the lengthy examinations required. Lizard and bird extinctions may have led to recent mosquito-borne dengue fever and Salmonellosis outbreaks and to a sharp decline in farming due to insect predation on crops. The poultry industry has been decimated; most eggs now imported. In addition to vanquishing many native species, the Brown Tree Snake is besting its human enemies as well. The most controversial attack method is airplane-drops of mice laced with Paracetamol, a snake-toxic pain killer. The mice are attached to tiny cardboard parachutes (who makes these?!) designed to keep the bait in trees and away from children and domestic animals. The “tiny assassins” program costs the US government an estimated $8,000,000 annually. Trapping has proven to be the most effective control technique, but success hinges on using many traps. As the modified minnow traps are baited with live geckos and mice, maintenance is very labor intensive. Snake-detecting dogs, debris and scrub-growth removal, and snake barriers are also used with varying degrees of success. Research is being conducted by many organizations, including the US Geological Survey, Princeton University and the National Zoological Society. Manipulation of breeding biology, snake diseases and parasites, poisons, and heat-fumigation treatments for cargo areas are being explored as control measures. Another very irregular fact about it is that it is not kept in captivity, despite its adaptability, catholic diet and potential for color variations. Why? Why they don’t hunt it for food instead? Consuming snake isn’t common in western countries, but it is not difficult to start I think. Also it could be exported to China or any other country with tradition of using snakes for food or traditional medicine. Its leather might be used as well. I don’t think it will be eradicated, neither I believe it is the best, but at leastthe populations will be managed.